I was tasked with designing a spaceship engine for a recent project here at Boom Box. Normally when designing engines, I mimic acceleration by pitching up over time. In this instance, however, the spaceship accelerated at high speed over a long scene. Pitching up at that rate over a long stretch of time could cause distortion at the polar ends of my pitched steady, or may sound strange considering the starting point of my engine would sound drastically different than the end. Because I couldn’t pitch up through the whole scene, I created a Shepard Tone using my engine steady to accomplish this design goal. Step 1: Choose a steady with constant pitch and volume and edit it to a 12 second long clip. 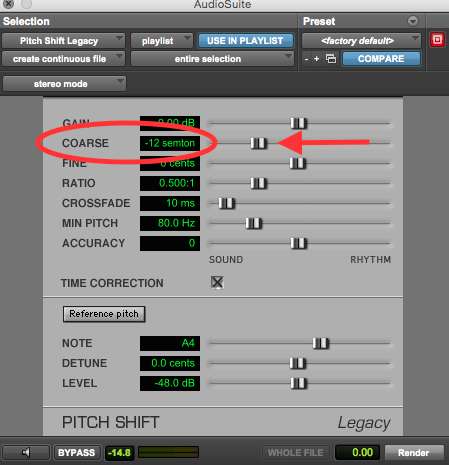 Step 2: Duplicate your track so that a copy plays simultaneously with your first. Step 4: Dynamically pitch both the original and the duplated clip up one full octave (or +1200 cents) over the length of the full 12 second clip. If using Waves SoundShifter, as I did, make sure to set your mode to “unlinked” so that you do not change the length of your clips. 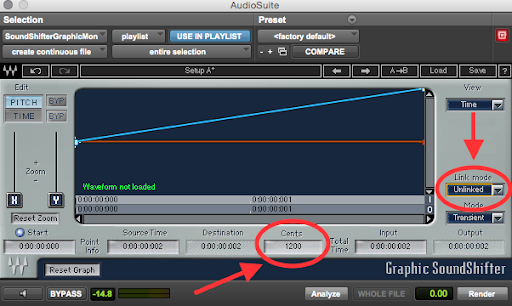 Also, make sure that your AudioSuite Handle Length is set to 0 in your ProTools Preferences. STEP 5: Using Volume Automation or Clip Gain, dynamically change the volume of the original clip from 0dB to -16dB over the course of the full clip (12 seconds). Dynamically change the volume of the duplicate clip from -16dB to 0dB over the course of the full clip (12 seconds). Step 6: Create a loop from these clips, using about a 4 frame crossfade. Depending on the steady you start with, you may need a longer or shorter crossfade to mask the loop. I’ve had the most luck with sounds similar to turbines. Layering varied sounds also help mask obvious loops. A huge thanks is owed to Brian McKeever of Soundtrack Boston. He taught me how to create a Shepard Tone (as well as a wealth of other audio post-production knowledge) and I’d like to give him full credit for the information in this blog post. You rock, Brian! Tell us about some shephard tones that you’ve created below!